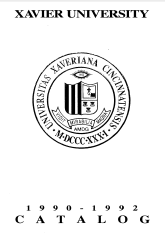 Xavier University Course Catalogs are published by Xavier University Office of the Registrar. All rights reserved. The images may be copied by individuals or libraries for personal use, research, teaching or any 'fair use' as defined by copyright law. Permission to reproduce materials in this collection for publication or distribution must be obtained from the Xavier University Office of the Registrar. Xavier University Bulletin Vol. XXIII June 1939 No. 3. The College of Liberal Arts. Catalogue 1938-1939. Announcements for 1939-1940. Published in February, May, June, and August. Xavier University, Cincinnati, Ohio.